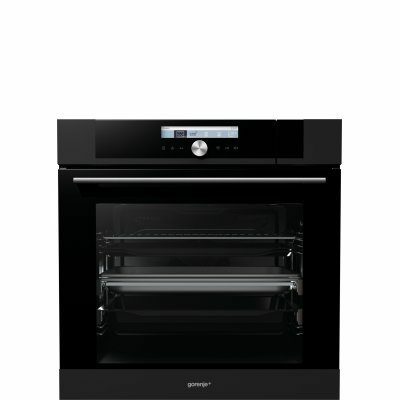 Pyrolytic or multi-function oven, conventional baking combinations with microwaves or steam – the clearly laid out DotMatrix display and a large centrally positioned knob make oven control consistent and fully adjustable to your desires. 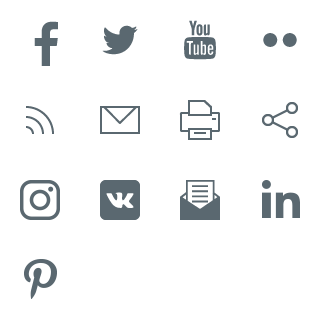 You may choose to confide in the preset Auto or Simple programs, or you may choose your own settings that you can tweak with the complex yet very easy to use Pro options. With the new STEPbake system, you can now cook your food in several steps. If you are a fan of slowly developed flavours that require long cooking at low temperature, you will surely appreciate the slow cooking function. 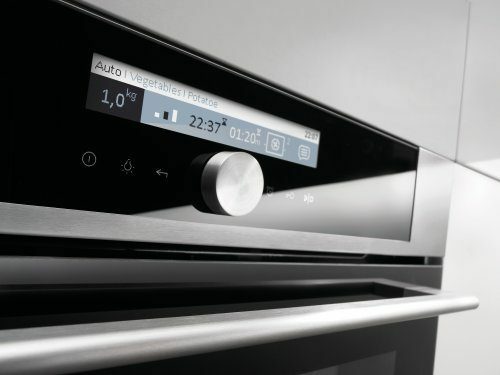 Complex technology in the background is paired with simple controls that combine a knob and touch control. The design is impressive for its convenience and pronounced elegance. Truly even cooking of several dishes on various levels in the oven requires perfect circulation of heating air or steam. Gorenje's MultiFlow 360° system makes sure the circulation is optimal in every corner of the oven cavity. A specially perforated 3D rear wall allows smart multi-point blowing. Combined with the fan, this leads to air or steam circulation that exposes the food to heat and cooks it evenly regardless of which level the baking tray is placed on. Cooking several dishes at once? Why not? 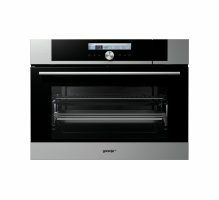 Gorenje+ ovens allow arranging the baking sheets in five different height levels, and baking on three at the same time. The advantages of multi-level cooking truly shine bright in combination with the MultiFlow360° system which makes sure the food is done evenly, as well as faster with lower power consumption. All Gorenje+ oven models, including microwave ovens, offer the AquaClean simple cleaning function. Pour half a litre of water into a baking tray and activate the AquaClean function to heat it to 70°C for half an hour. The resulting moisture will soften any dirt on the oven walls. After the process, simply wipe the oven cavity clean with a soft cloth. Cleaning effect is excellent! Eliminating the need for detergents, this method is also friendly to the environment. A gentle touch is enough to simply, softly, silently, and elegantly close the oven door. This comfort is based on an entirely new construction of door hinges. Further improved GentleClose system is comparable to the most elegant solutions found in kitchen furniture. Perfection in construction also provides lasting durability. 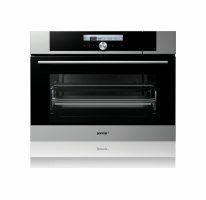 The new Gorenje+ steam ovens allow cooking without unwanted drops of water that can leave the food soaked or mushy. Cyclonic technology creates a mist of completely dry steam that is evenly distributed around the entire oven and the food. The bottom heater makes sure that even the droplets that are formed when dry steam comes into contact with cooler chunks of food are immediately vaporized, thus preventing any excess liquid. After the cooking process, the oven is completely dry and it does not require wiping. Gorenje+ combined steam oven boasts all the advantages of a conventional 60-cm-high oven, including the extra-large BigSpace interior, as well as all the benefits of a steam oven. In addition to conventional heating modes with the MultiFlow 360°, the oven impresses with steam cooking combined with hot air, with the MultiSteam 360° evenly distributing the steam around the cavity. The combination allows preparing delicious and healthy food in the shortest amount of time while retaining the flavour, the vitamins, and the nutrients. After the cooking process, the oven automatically pumps out the water used for steam cooking from the system, and a warning on the display will remind you to empty the water tank. The conveniently accessible water tank can be disassembled and washed in a dishwasher. The oven will determine and remind you when it is time for descaling. Defrost and Reheat functions make sure the ready-made food does not lose nutrients, appealing appearance, or structure during defrosting. Steam oven can be used to reheat individual dishes or an entire meal at the same time. Defrosting in a steam oven is uniform and gentle enough not to alter the structure of the food. When the food is reheated in a steam oven, it is not additionally cooked, and it never dries out. Therefore, defrosting and reheating in a steam oven is simply healthier. 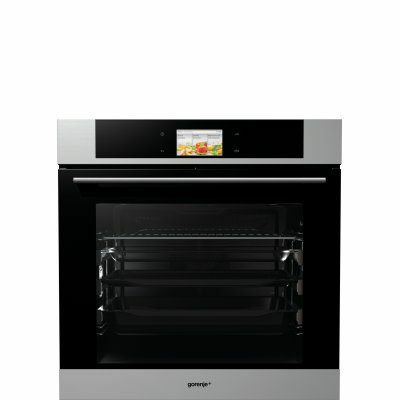 Gorenje+ steam oven is a convenient tool for keeping a healthy diet. It is available in two versions, differing by height: 60 cm or 45 cm. It is simple to use and its features allow the choice and combination of cooking procedures that truly make your daily meals nutritious and balanced. The food will retain its full flavour, aroma, colour, and nutrients. Fully extendible telescopic guides allow better view and more safety when inserting or removing the baking trays on two or three height levels. Most models feature as standard equipment the guides that reduce the danger of burning when handling the food on the baking tray and simplify both baking tray placement on the desired levels and removal of the trays from the oven. In other models, such guides are available as optional equipment. Heat sensors steer the automatic cooling system for the outside walls of the oven until the temperature drops to below 60°C. The DynamiCooling system makes sure the temperature of the oven walls is suitably low on the outside at all times. 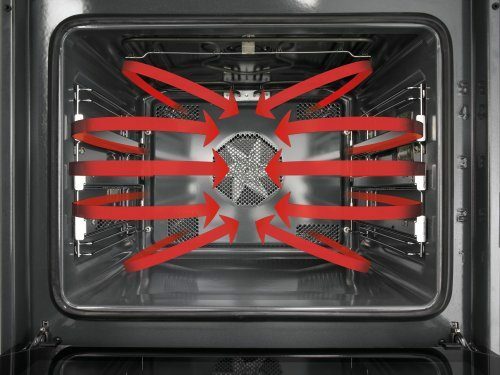 A special fan in the oven housing mixes the air from the environment with hot air from the oven to make sure the cooled air constantly circulates just under the appliance outer walls. This system effectively prevents the danger of overheating of furniture even during processes with the highest temperatures, such as the pyrolytic cleaning process. The multi-layer heat-reflective glazing and select insulation materials improve oven performance and significantly reduces power consumption. All ovens, including microwave ovens, feature triple glazing and the doors on ovens featuring the pyrolysis function even feature a four-layer heat-reflective glazing. The outside of the door will thus remain safe to touch at all times. Carefully thought-out heater placement also contributes to excellent cooking results. One large and one smaller infrared heater are placed in the recessed oven ceiling, tucked away safely to prevent burns from touching them. As the heaters are placed at various heights, heating is more even and always optimal. Such heater placement makes the ovens safer and more efficient. In most models, the upper heater may even be lowered to simplify access for cleaning. Selected models of Gorenje+ ovens feature a special meat probe. The probe is inserted into the chunk of meat and the desired core temperature is set. An indicator on the oven control unit will signal when the meat is done. Your roast will be always perfect owing to the meat probe. New tank design improves its convenience. As the water tank is integrated into the control panel, the interior of the steam oven is larger than before. The tank is easily accessible and it can be replenished even after the cooking process has started, without interrupting it. A special ergonomic tank design with built-in wave barriers prevents spilling. After the cooking process, the tank can be disassembled and washed in a dishwasher. The brand new concept and composition of enamel in the oven cavity SilverMatte makes the oven and the baking trays resistant to even the highest temperatures, microwaves, and steam. The enamel is free from any micro pores; its remarkably smooth surface is resistant to scratches. This enamel prevents the fat from sticking or burning onto it, improving bacteriological cleanliness and making cleaning very simple. 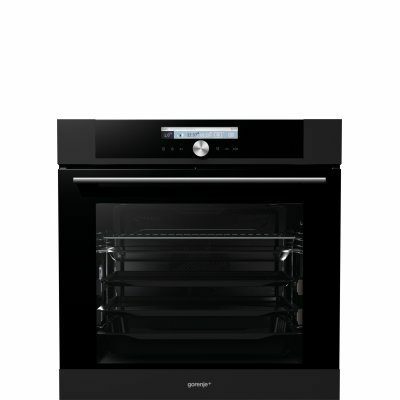 The bright enamel colour improves the view of the oven, and the temperature characteristics of the SilverMatte contribute to more economical use of energy. All baking trays with the new enamel are suitable for use in all types of ovens, including Gorenje+ pyrolytic and steam ovens. More spacious ovens allow you to cook a larger quantity of food – not only because of even air circulation at all levels, but also because of 46-cm wide baking trays. 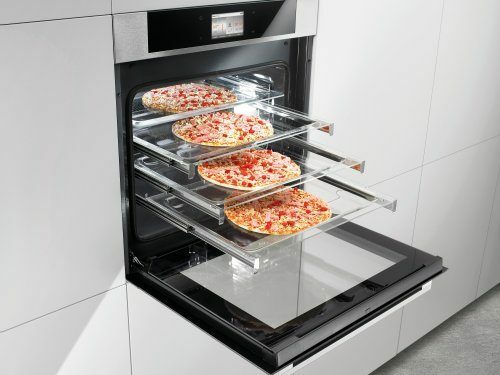 Innovative solutions allow a larger interior and the oven width is fully used. There is more space on each baking tray, and the superior technology makes sure the food is cooked evenly on all levels.